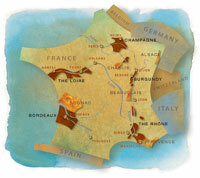 The most productive zone in southern France is made up of the twin regions of Languedoc-Roussillon. The statistics are impressive; it is the world's largest wine region, with approximately 250,000 hectares under vine, constituting one third of France's total plantings. The Languedoc-Roussillon region stretches from Provence along the Mediterranean coastline to the Spanish border. Although the two regions are administratively joined, they are quite distinct with Languedoc's most productive vineyards largely planted on the broad, dry coastal plains, its finest wines grown in the higher, cooler vineyards located in the foothills of the Pyrenees. Grenache, Carignan and Cinsault are some of the red varietels of the region, while Ugni Blanc, Marsanne and Viognier are examples of the region's white varietels. The region also produces some excellent dessert wines.